Peacefully at home surrounded by her loving family, Brigid R.I.P. Wife of the late Pat and loving mother of Angela, Gemma, Nuala, Paul, Anne Marie, Eoin, Brian and Patrick. Funeral from her late residence, 127 Knockahollet Road on Wednesday at 1.15pm for 2.00pm Requiem Mass in St Joseph's Church, Dunloy, interment afterwards in adjoining cemetery. Our Lady of Lourdes pray for her. Deeply regretted by her sorrowing sons, daughters, brother Neill, sister Betty McClenaghan and entire family circle. Family flowers only please, donations in lieu if desired to Marie Curie or the Alzheimer's Society, c/o McKiernan and Sons, 45-47 Maghera Street, Kilrea, BT51 5QL. 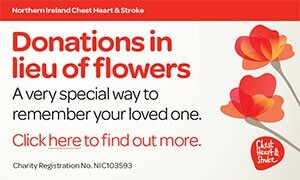 Family flowers only please, donations in lieu if desired to Marie Curie or Alzheimer's Society, c/o McKiernan and Sons, 45-47 Maghera Street, Kilrea, BT51 5QL. I am sorry to tell you that Brigid McGuckian (Dunloy) has passed away.